THIS BOOK BRINGS 21ST CENTURY CLARITY TO PROPHETIC EVENTS RECORDED IN THE BOOK OF REVELATION AND THE LORD'S CALLING FOR WARRIOR-SPIRITED CHRISTIANS OF THIS GENERATION. We are right on the verge of devastating events that will create great fear and chaos throughout the world and especially in our increasingly immoral and comfort-seeking nation. The reader is encouraged to follow Dr. Donald Bell in his in-depth study of Scripture that will bring greater clarity to numerous end-time events recorded in the Book of Revelation -events which are currently unfolding before our very eyes. The mission objective for this book is to build-up strong, warrior-spirited Christians who will lead many to prepare for the challenging events which will precede the second coming of our Lord, Jesus Christ. We are no longer free to play the role of civilians for dark times are rapidly descending upon America and the Lord is calling for His people to be a strong light who will stand for the Kingdom of God in the midst of increasing darkness. Now is the time to prepare to take advantage of the rising opportunities in witnessing to the lost and confused who will soon cry out for truth as they frantically seek help in the midst of tremendous chaos. The coming battles will be fierce; this is a calling for servants of Christ to become God's anointed witnesses equipped to stand strong against the forces of darkness which are being unleashed in greater power than ever before. 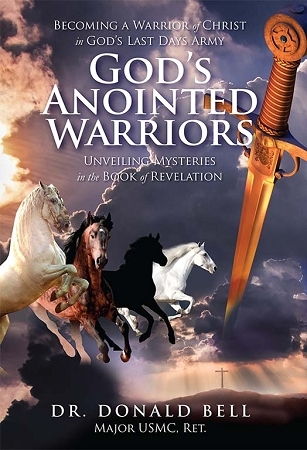 God's Anointed Warriors is a practical field guide to prepare the reader to respond to the Lord's ministerial calling and to endure victoriously to the end of the Great Tribulation war against these forces of darkness.